THANK YOU REPRESENTATIVE GABRIELLE GIFFORDS! 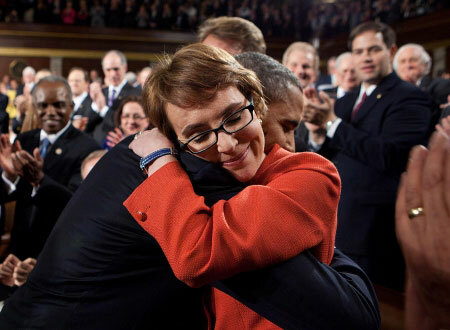 I love you Mrs. Gabrielle Giffords. Each time I see you on the telly, tears of joy sprout upon my face as I see a real miracle before my eyes. Every so often God gives us glimpses of his presence in a modern day “burning bush” and I see God every time I see you Mrs.Giffords-Kelly! I commend you and your husband Mr. Mark Kelly for all of your contributions to our great country. I love you both. My utmost in the highest to the both of you. May you continue your remarkable recovery as I will be praying for you both.